Small Massachusetts Militia document, a bit larger than 6-1/2" x 3", dated 26 April 1816, informing Richard Neal of Eliot, Maine, that he must appear at the house of Commanding Officer James Goodwin on Tuesday, 7 May 1816, and be armed and equipped for military duty. 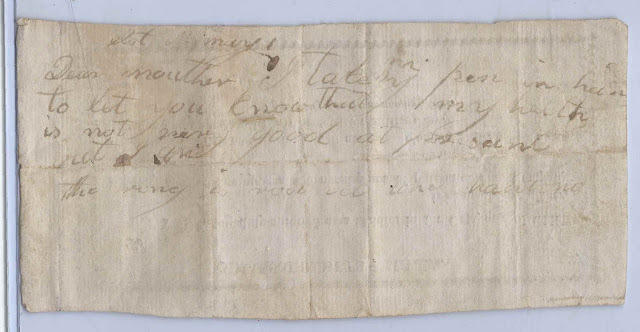 Someone, presumably Richard, wrote a note to his mother on the reverse, advising that his health was not very good at present. 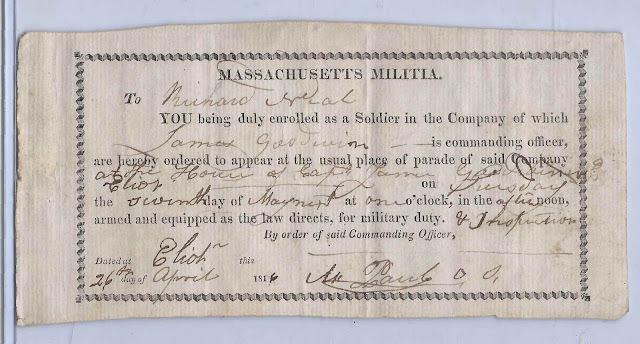 It's possible that this Richard Neal was the Richard Neal born in Kittery, Maine, on 4 April 1790, son of John and Elizabeth (Hubbard) Neal of Eliot, Maine. Richard died at Eliot, Maine, on 6 May 1857. According to an online genealogy of the Goodwin family, on Richard married Elizabeth Goodwin, "Betsey", who was born 11 April 1788 at Kittery, Maine, the daughter of Daniel and Sarah (Hobbs) Goodwin. They married 21 March 1819, according to an entry in the book Old Kittery and Her Families by Everett Schermerhorn Stackpole, published in 1903. 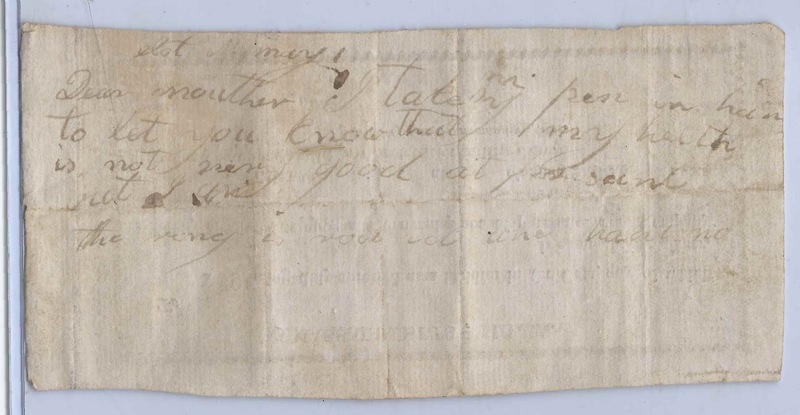 Tragically, again referring to the Goodwin genealogy, this Richard Neal, who was farming at the Neal Garrison on Goodwin Road in Eliot, killed his wife Betsey in a "fit of mental derangement" on 4 October 1825. Read an account of the murder in the book America Bewitched: the Story of Witchcraft After Salem, written by Owen Davies, and published in 2013 by Oxford University Press. Sarah Neal, born 11 November 1824; died 26 February 1908, unmarried. Is it any wonder that three of the four children never married? As to what happened to Richard after the murder of his wife, I don't know, except that he lived on until 1857. If you have corrections to the information above, or if you feel that the Richard Neal in the military document is not the Richard Neal who married Betsey Goodwin, please leave a comment or contact me directly. Thanks! This one got me curious, so I checked York County court records to see if Neal was prosecuted for the crime. It appears that he wasn't, but he was placed under the guardianship of Elisha Goodwin and James Goodwin (his former commanding officer?). The children, Elizabeth, John, Daniel and Sarah, were placed under the guardianship of Jeremiah Goodwin of Alfred. Richard Neal petitioned the court on 1 Jan. 1828, asking that he and the children be discharged from their respective guardianships. The petition stated that "Said petitioner is not lunatic or distracted, but of sane mind" as well as "prudent, temperate, and industrious, and fully capable of managing his property and of taking care of himself" and "taking care of, providing for, and educating his children and managing and taking care of their property." The petition states further that "His reason and capacity has been long and permanently established." Captain James, Elisha and Jeremiah Goodwin all appear to have been brothers of Neal's murdered wife, so I think it's likely that this was the same Richard Neal referred to in your document. Wow - that's fast and exhaustive work, Chris! Thanks for providing the link. Richard's in-laws apparently thought a lot of him, despite his momentary lapse; even so, you have to give them a lot of credit. Yeah, I'm not sure how fond I would be of my brother-in-law if he decapitated my sister.